Working as a Massachusetts Realtor for almost twenty five years, I can say without question that one of the greatest fears of any home owner is having a water problem in their basement! When buying a home, the uneasiness of having a water issue will be magnified ten fold if the intention of the owner is to finish the basement as additional living space. Having a little bit of water in an 2oo year old colonial with old stone foundation walls and a dirt floor is far more acceptable than seeing even a drop of water in a luxurious finished lower level that you find in many high end homes today. When you have a beautifully finished space with plastered walls, fancy wood work and plush carpeting the last thing you want to deal with is a water issue. Not only will a wet basement have a serious impact on a homes marketability and value, it can create health risks due to the possibility of mold. When you have mold you also have another very costly problem to fix as well! I won’t even mention the fact that where there is water there is also insects not too far behind. Water issues can lead to termites and carpenter ants…two things you want to avoid! If you own a Massachusetts home solving a basements water problems boil down to how and where the water penetration occurs. One of the easiest fixes to a basement water issue is when the water is coming from improper drainage around the home. Some wet basements are easy to cure just by unclogging the exterior gutter system. It is amazing how many times I have come across a home that has a couple years of leaves that have become lodged in the gutters, completely rendering them useless. When it rains you see the water just pouring right over the gutters into the ground below causing a serious back up where the water has no where to go. Another possible issue with basement water problems occur when the downspouts of the gutters are not extended far enough away from the foundation again causing the water to pool. One solution besides extending the downspouts is permanent underground piping that is capable of moving larger quantities of water further from the house. If the gutters have been cleared of all debris and the water from them is taking the intended path it may be that the yard is improperly sloped back towards the house. Most experts recommend that your yard slope at least 6 inches to a foot away from the house. In other words there should be a crowning effect that carries the water away from the foundation. Correcting a drainage problem such as this can usually be fixed by consulting with a professional landscaper. Be careful that you do not add to much soil close to the foundation of your home. After listening to numerous home inspectors over the years the recommended amount of concrete showing from the ground to the siding should be six inches to avoid insect and water damage. If the water penetration into the basement can be seen coming through a crack this is generally an easy fix as well. There are times where a home owner could fix this themselves if the crack is small enough. If this is the case mixing up some hydraulic cement and plugging it into the crevice should suffice. When the crack is on a large scale the recommending treatment is through an epoxy injection. The process of epoxy injection closes the crack and restores the structural integrity of the wall. 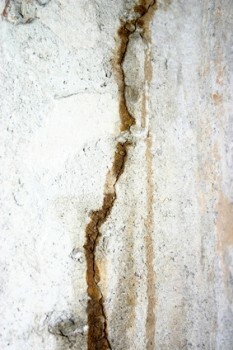 The company that is highly regarded for repairing foundation cracks in Massachusetts is Crack-X. I have recommended them for crack repair on a number of my clients homes and they have always done an excellent job. Fixing a crack with Crack-X will be far more costly than doing the work yourself but in the long run will be worth it. If water is leaking the basement at the bottom of the wall or at the seams where the wall meets the floor, the issue probably isn’t surface water but hydrostatic pressure pushing out water that is in the ground. If this is the case check to see whether you have footing drains. A footing drain is underground pipes installed when the house was built to carry water away from the foundation. There should be a drain or manhole in the basement floor or a clean out pipe just above the floor line. The drains could be clogged, in which case you can just flush them out with a garden hose. Another avenue to try if you don’t have footing drains is to create what is called a curtain drain. A curtain drain is a type of French drain system that is underground in a trench with gravel that diverts the water away from the house before it gets there. This type of drainage system would be far less expensive than either an interior or exterior water proofing method. An interior drainage system can be a less costly fix than an exterior drainage system as long as the basement is unfinished. If you cant keep water penetration occurring from the outside this is the way to go. An interior drainage system is one of the most common you will see. An interior system is created by sawing out a channel of concrete around the perimeter of the foundation. Perforated pipe is put in the dug trench. The pipe drains to the basements low spot where a sump pump will remove the water. An outside water proofing system can be one of the most effective means of keeping water out of a basement but also one of the more expensive solutions. With an exterior system a French Drain is installed around the perimeter of the home. The reason why this is the most costly method is because some serious excavation work has to take place around the entire home. It is possible you may have to remove brick patios, walkways, decks and mature landscaping! You could easily spend ten’s of thousands of dollars with this method but if you have water penetrations from multiple locations it could be the best solution. One of the more well known Massachusetts Basement water repair companies that solves the whole gamete of water problems is a company called B-Dry Waterproofing. B-Dry is located in Lexington Massachusetts and they can be reached at 781-861-7897. The other well know Massachusetts basement water repair company is Basement Technologies. The Basement Technologies company also does a wide variety of water penetration fixes. They are well know for their jingle 1-800-busy-dog. For all your basement water proofing needs you can visit their website at Basement Technologies. Keeping your basement free of water will go a long way in making sure you are able to get top dollar from your home when it is time to sell! About the author: The above Real Estate information on solving basement water problems was provided by Bill Gassett, a Nationally recognized leader in his field. Bill can be reached via email at billgassett@remaxexec.com or by phone at 508-435-5356. Bill has helped people move in and out of many Metrowest towns for the last 24+ Years. I service Real Estate needs in the following towns in Metrowest MA: Hopkinton, Milford, Southboro, Westboro, Ashland, Holliston, Medway, Franklin, Framingham, Grafton, Hopedale, Mendon, Upton, Northbridge, Shrewsbury, Northboro, Bellingham, Uxbridge, Worcester and Douglas. Thanks Paul for the compliments on my article about fixing water issues in basements. 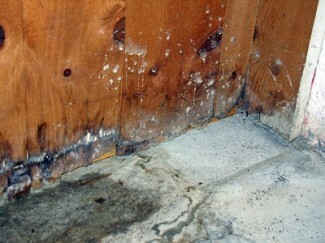 You are certainly right about taking all the necessary precautions to prevent mold after you have had water. There are lots of folks that will walk from a home purchase at the 1st sign of mold even though in most circumstances it can be treated fairly easily. Geez Bill, next time you decide to use my photo in your blog, try not to make it the one taken right after I hung up the phone with the negotiator, okay??? Great post Bill … I have reposted this info as well. It’s perfect for anyone with a basement regardless of locale! Thanks! Thanks Allyson! There are plenty of people that experience water problems in their basement and don’t know where to turn. Bill this is such an important subject for both owners and buyers and I must say you did a great job with your post, addressing the issue of water problem in the basement. Thanks Claudia! I am glad you enjoyed my article on how to fix water issues in a basement. No gutter cover keeps everything out. For example, bees love to get into covered gutters, build a beehive and then leave. The hive stays, floats down to the outlet and clogs the outlet. This clogging occurs with all debris that gets into gutters, covered or not. So the problem is not debris in the gutter. Water always follows the path of least resistance and flows over, under and around debris in the gutter. If the outlet is clear the water will flow out of the gutter. If the outlet is not clear the water will not flow out of the gutter. Properly flowing gutters are all about the outlet, the clean, clear outlet. But keeping outlets clean is (was) a difficult, dirty, time-consuming even dangerous task. Not any more. With The Spout Off all homeowners can check and clean their outlets, 1, 2 even 3-story in less than 1 minute standing safely down on the ground. The SOLUTION to all rain gutters working properly is ensuring all outlets in all gutters are always clean and clear. The Spout Off does this. Bill, great article. This resonates with me on a personal level as I am dealing with this very thing in my own home right now. Not fun, not cheap. Annie that is too bad! I hope you get your basement water issues fixed soon.